When you watch tourists in Venice you often see what you’ll notice about tourists everywhere in the world. They will briefly gaze at beauty then move onto the next big thing. March 2014, single image, additional exposures for highlights, focal length 35mm, aperture f/8, shutter speed 87 seconds, ISO 250, 10-stop ND filter, tripod. Rarely will you find someone dwelling on any site for more than five minutes. We can blame the internet for short attention spans or maybe it is just the restlessness of mankind. Art collector and American Journalist, James Jackson Jarves was not this way. 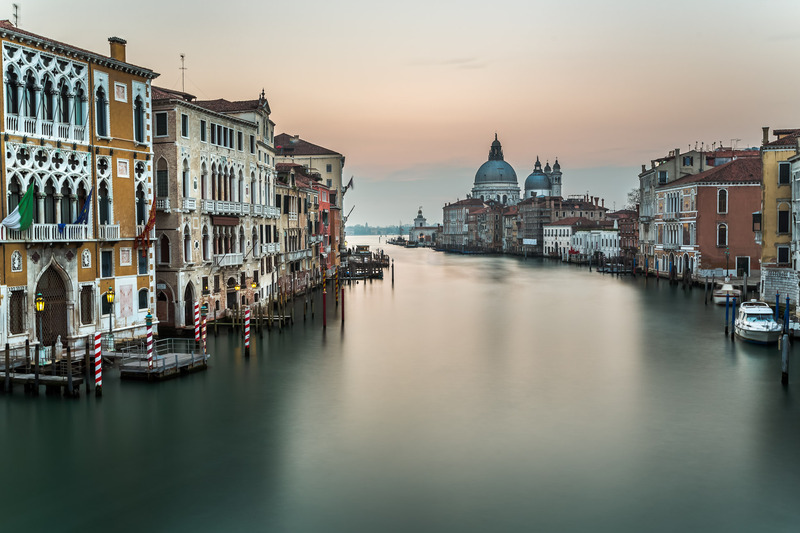 There is a story that when he visited Venice, specifically the church you see in this photo, Santa Maria della Salute. He laid on his back in the church to admire the paintings on the ceiling for hours. Tourists had to walk around what they may or may not have perceived as a mad man. Jarves would become the first American art collector of Italian primitive arts. Jarves’ appreciation to stop and bask in beauty is definitely something I can relate to as a photographer. Every place I travel I spend time planning compositions specifically by stopping to admire beauty then return later to permanently capture the view in a photograph. In this particular shot I arrived long before sunrise and made hundreds of shots to capture every single change in the lighting of this scene. I made the blue hour shots, the cold shots just before sunrise and the golden sunrise shots watching the landscape unfold before my camera lens. My direction is Eastward with the sun directly in the frame behind the church making for this lighting effect. In these moments where I devote myself to capturing the perfect timing, lighting and setting I truly feel at one with the beauty of places like Venice. I try to translate this admiration to all aspects of travel to find the perfect shots for my dedicated audience.